BRAND NEW We are pleased to introduce our new Perfect-Turf all weather pet grass play yards. Four of our seven play yards now have pet grass so the dogs will enjoy the yards 365 days a year with NO MUDDY PAWS! Whether you are interested in short/long-term dog & cat boarding, doggie daycare or just an afternoon of salon and spa pampering for your pet, Cedar Dale offers a broad range of services geared to fit your pets needs - be sure and ask us about our fun activities & daycare programs. ​﻿Cedar Dale Pet Resort is a full service pet resort that offers superior care for your pets. We are conveniently located on 8 beautiful acres along Highway 12 on the northeast corner of the Pell Lake Drive Exit. Our grounds are sprawling and manicured, providing a park-like setting. We love our new Perfect-Turf all weather pet grass allows dogs to enjoy the play yards 365 days a year with NO MUDDY PAWS! 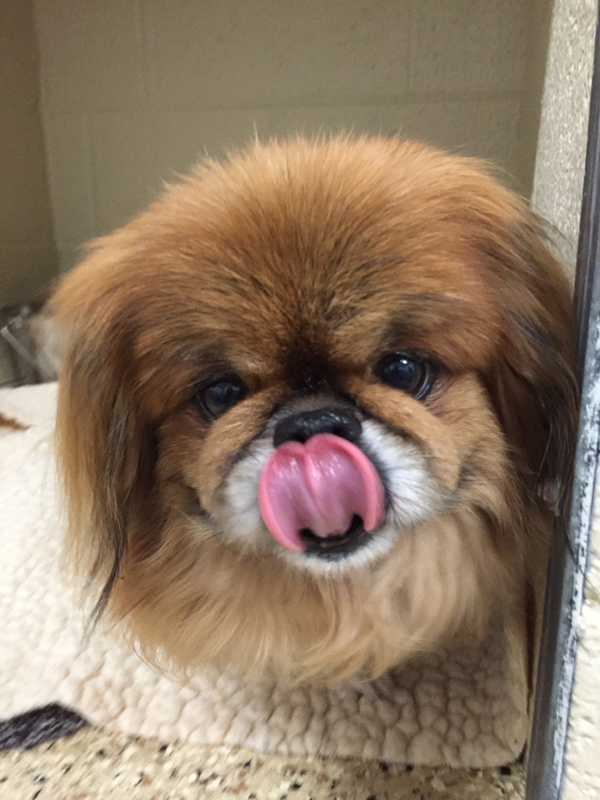 Cedar Dale Pet Resort & Spa can accommodate up to 100 guests and has been frequently updated, bringing it to the highest standards of the pet care industry. Some of our regular clients come from as far away as Chicago, Milwaukee or Madison. ​Since the facility is located only 4 miles from the Illinois border Cedar Dale has a long list of client from southeastern Wisconsin, but just as many from the north Chicago suburbs. ​Those clients traveling to Cedar Dale from the more metropolitan areas have a real appreciation for the fresh air environment that their pet will enjoy while with us! Holiday Meal - $5 ea. Birthday Cupcake - $5 ea. Frosty Banana Nut Cup Treat - ​$3 ea..
​(At the northeast corner of Pell Lake Dr. and Hwy 12, just 4 miles southeast of Lake Geneva, Wisconsin) Proudly providing dog & cat boarding, doggy daycare, as well as professional all-breed dog grooming to the following Wisconsin communities: Lake Geneva, WI Fontana, WI Delavan, WI, Walworth, WI Burlington, WI Twin Lakes, WI Silver Lake, WI Paddock Lake, WI Elkhorn, WI Wilmot, WI Trevor, WI Pell Lake, WI Williams Bay, WI Richmond, IL Spring Grove, IL Johnsburg, IL Mc Henry, IL Hebron, IL Wonder Lake, IL Round Lake, IL Grayslake, IL and many many other communities!
" Love love love Cedar Dale!!! My dogs attend their doggy daycare regularly and we also board them & groom them at Cedar Dale! Staff & owners are highly knowledgeable, professional, very caring & friendly!! They care for our dogs like they are their own!! Excellent place!! My dogs love going there to see all their friends & doggy friends." " I was very nervous about boarding my pet; but, my concerns were alleviated by the excellent care our dog received while at Cedar Dale. The facility is clean, fun, and welcoming. I highly recommend Cedar Dale Pet Resort for boarding and doggy day care." 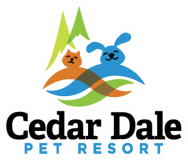 " W e have used Cedar Dale a few times to board our dogs & cat. It is very clean & the dogs have nice open areas to play in outside. The staff has always been friendly and their rates are reasonable. I never worry about my fur-babies when I'm away. I know they're in good hands. 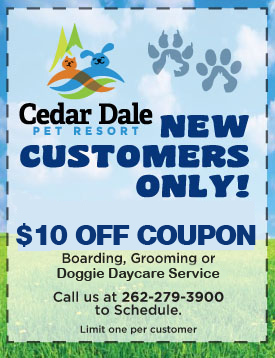 I know many people in the area who also board here, or use the grooming services, and they are all pleased as well.."
﻿﻿" My dog and I LOVE Cedar Dale Pet Resort. The staff is very kind and extremely friendly. I use the doggy day care and my dog adores the staff and his time with his doggy friends. He would love to go there every day! I have used the grooming area and he comes home clean and with a cute bow. The prices are very reasonable. I highly recommend Cedar Dale Pet Resort."